So you want to know the origin of Judaism. To answer the question of how old is Judaism, you first should know that the question divides in two. It depends if you want to know when did Judaism begin as a people and nation, or you want to know the start of Judaism as a religion. The start of Judaism was by the patriarchs Abraham, Isaac and Jacob (1900 BCE). After Jacob went to Egypt with his twelve kids and seventy grandchildren, the Jews became a nation of six hundred thousand men throughout their 210 years of slavery in Egypt. 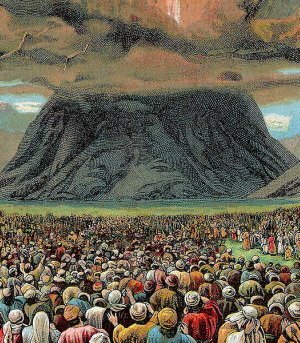 The start of Judaism as a religion was at Mount Sinai at the great revelation (1400 BCE). The start of Judaism as a religion was when Hashem (God) gave the ten commandments to the Jewish nation at Mount Sinai. From then on for forty years the Jewish people wandered in the Sinai desserts and Moses taught them the Torah, as he heard it from Hashem (God). If you read till here you most probably figured it out already. The origin of Judaism started in the Middle East. The patriarchs Abraham, Isaac and Jacob walked and lived in the land of Israel. While the Jewish became a large nation in the land of Egypt. The start of Judaism as a religion was in the Sinai desert. So, now you got to know how old is Judaism, and where Judaism originated. And that Judaism is the first monotheistic religion. Want to know more on how Jewish law and culture continued after the start of Judaism? You will find all information in this site! Have a question, on Orthodox Jewish Matters? Need an answer? Please Email your questions, Chava will answer your questions with insight and wit. Have something interesting to say about the start of judaism? Have something interesting to say about Names of God in Judaism? Are you using Dating Jewish Online Service? Well you should know the customary gifts presented! Read about it! Links to best dating sites! How does it work when Dating Jewish Girls? What do you need to know about Jewish dating singles? Read trhe article and enjoy!